"That's it?" we gasped when we got our first view of that American iconic symbol, Plymouth Rock. A young couple about to walk away from the exhibit laughed, "We said the exact same thing." There it was, small enough to pack into a Mini Cooper (with all the seats removed, of course). It certainly didn't look imposing enough for a group of people to make a landing point. The small size wasn't the only surprise this great rock had in store for us. 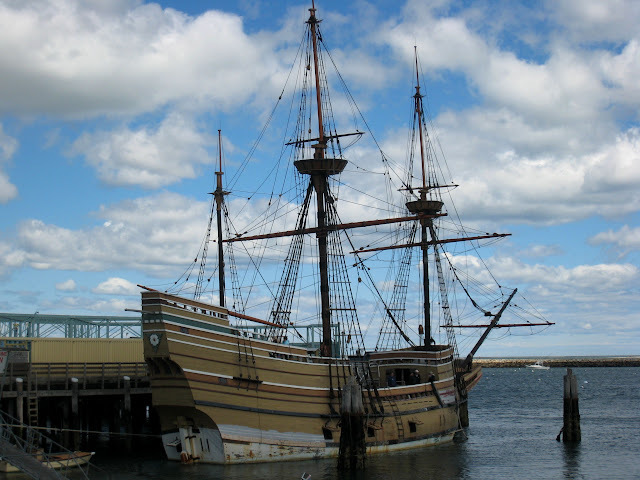 We learned that the legendary boulder where the Mayflower passengers disembarked was never mentioned by the Pilgrims in contemporary accounts. 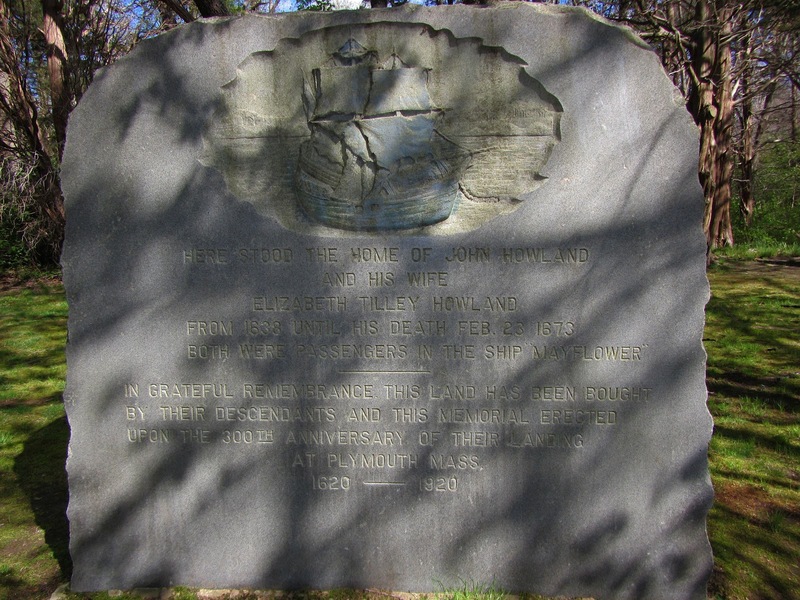 In fact, it was 120 years after they landed at what became Plymouth before someone indicated that the early settlers had landed on a rock. 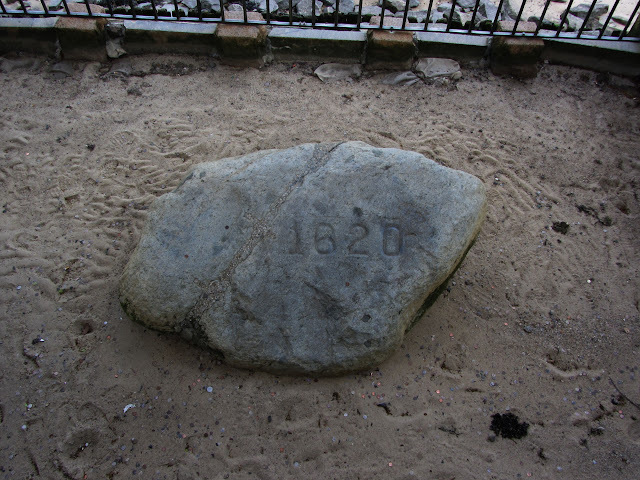 The town had decided to build a wharf at the landing site in 1741 when a 94-year-old resident of Plymouth expressed concern about the historical value of the spot and, based on knowledge supposedly passed down to him from his father, he pointed out the precise rock on which the Pilgrims had first stepped. 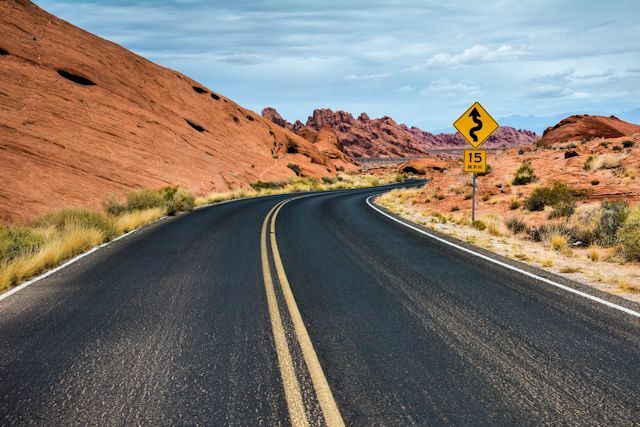 Since then, the poor rock has been relocated from one part of the city to another numerous times, during which it has been broken in half on more than one occasion. The date 1620 was not carved into the rock until the late 19th century when it was housed in a Victorian canopy with iron gates to stop souvenir hunters prone to taking home a piece of the rock. Since 1920, the great stone has been housed under a formal Roman portico. Only about a third of the original 20,000 lb. rock remains, and its location under such a lofty structure makes it appear even smaller. At the top of Cole's Hill, just above the rock's current home, stands a sarcophagus housing the remains of numerous Mayflower Pilgrims. The bones were collected and stored here after a couple of unfortunate accidental releases of the Pilgrim fathers and mothers from their graves. 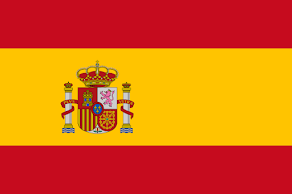 The first occurred in 1735 when flooding washed bones down the hill and into the harbor. 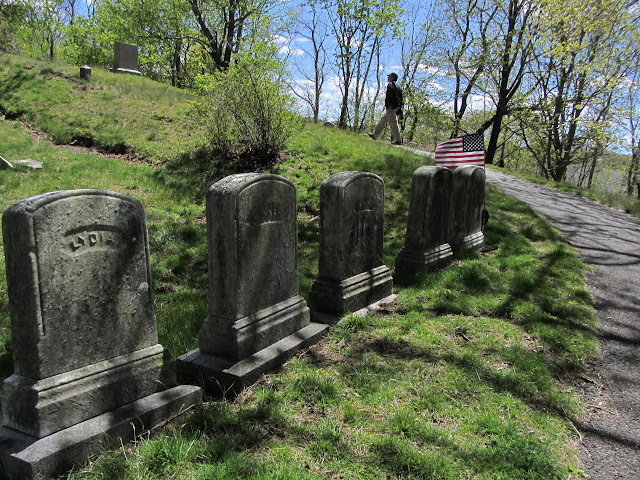 Later workers digging sewer lines in the 1800s turned up more ancestors. 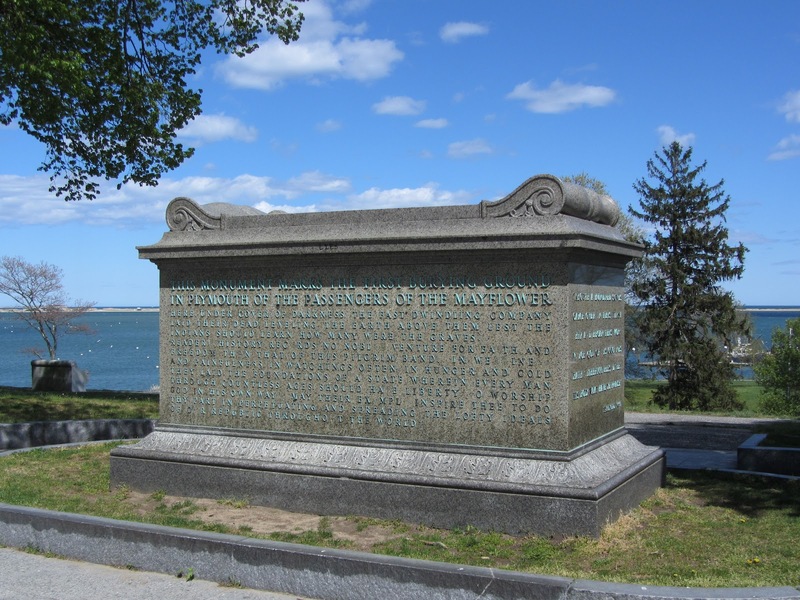 Once stored in a casket elevated over Plymouth Rock, the bones were interred in this sturdy sarcophagus in 1921. South of Cole's Hill, Leyden Street leads from the harbor uphill to the town square. This is where the Pilgrims began building their houses in 1620. 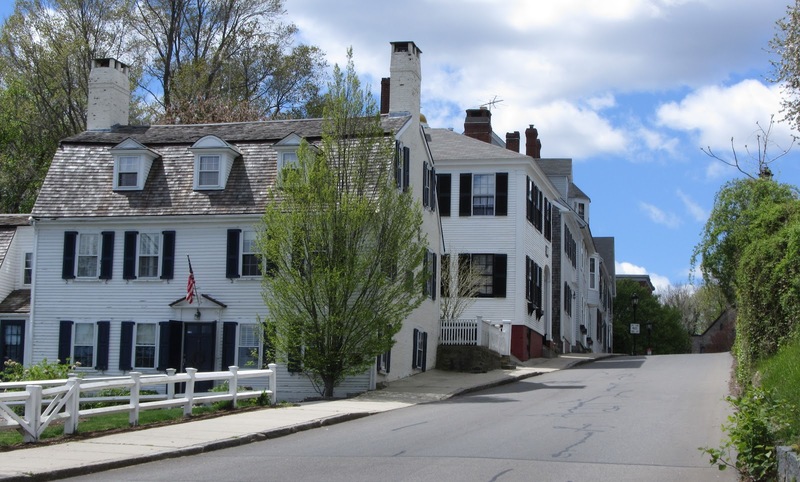 The street continues to be the heart of the town, today's version lined with an assortment of 18th and 19th century houses. 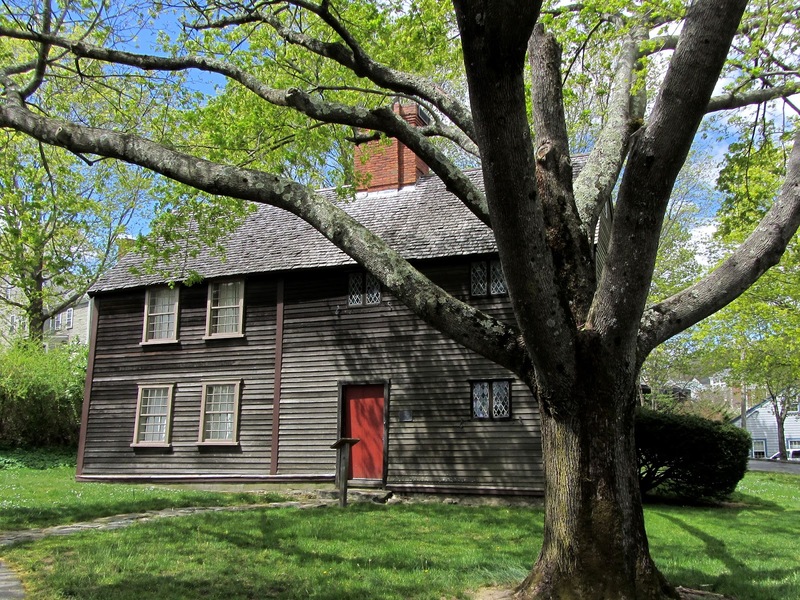 One of the early families residing on Leyden Street was John Howland, an indentured servant who had sailed on the Mayflower, and his wife Elizabeth Tilley, whom he met on the voyage. In the middle of a turbulent storm during the crossing, Howland was tossed overboard. He managed to grab hold of a rope dangling from one of the sails and was hauled back onto the ship. The Howlands went on to have ten children and 88 grandchildren. After surviving his near miss at sea, Howland lived to the ripe old age of 80, having outlived all other male passengers except one. A historic marker in the current village of Kingston indicates the spot where the Howlands built their later home. And, yes, in case you're wondering, we were drawn to this spot by a letterbox. Like a number of other Pilgrims, John Howland's final resting place is Plymouth's Burial Hill, a cemetery located on a high point above the waterfront. Among the other Pilgrims buried there are Governor William Bradford and Mary Allerton, the final surviving passenger. 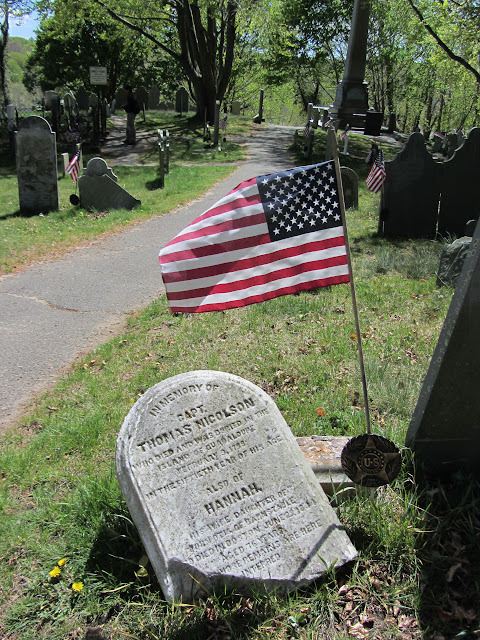 Squanto, a Native American guide and interpreter for the Pilgrims, is said to be interred in an unmarked grave at Burial Hill. After locating the letterbox hidden at the cemetery, we indulged our inner taphophiles and strolled through the beautifully maintained grounds, examining the ancient graves. 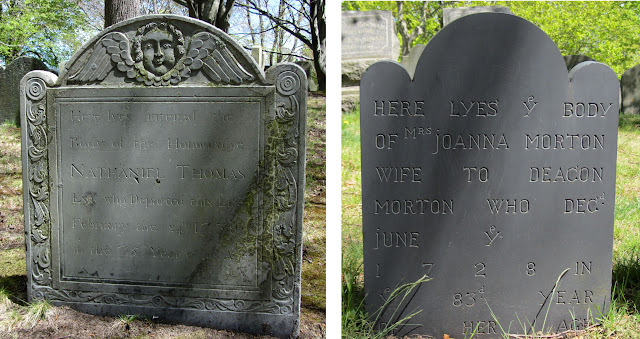 We had just commented on the remarkable condition of some of the 300-year-old headstones when we came across a group of volunteers gently scrubbing the markers. 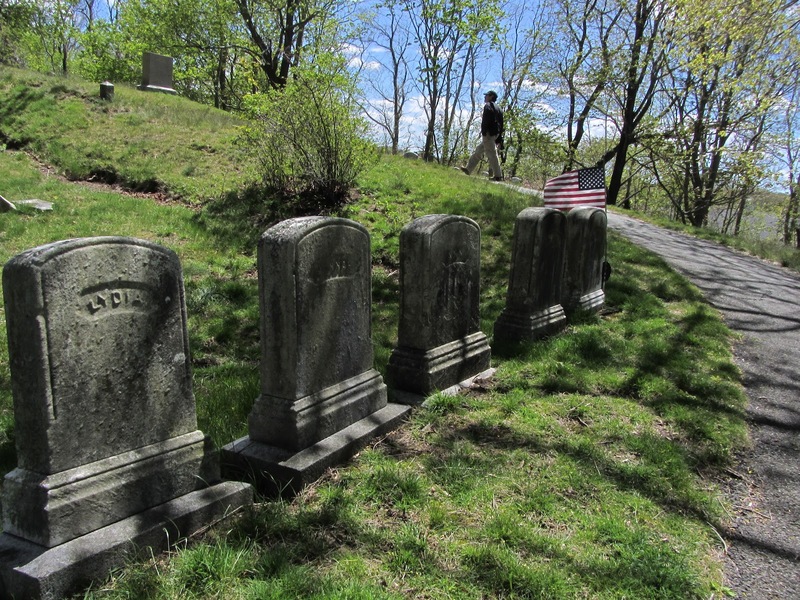 They told us that the cemetery had become quite overgrown until a local group of volunteers took an interest and began clearing away the weeds and brambles. The product they were using is D/2, a biocide that removes stains caused by plant and animal growth with no detrimental effects to the stone. The results were quite evident. 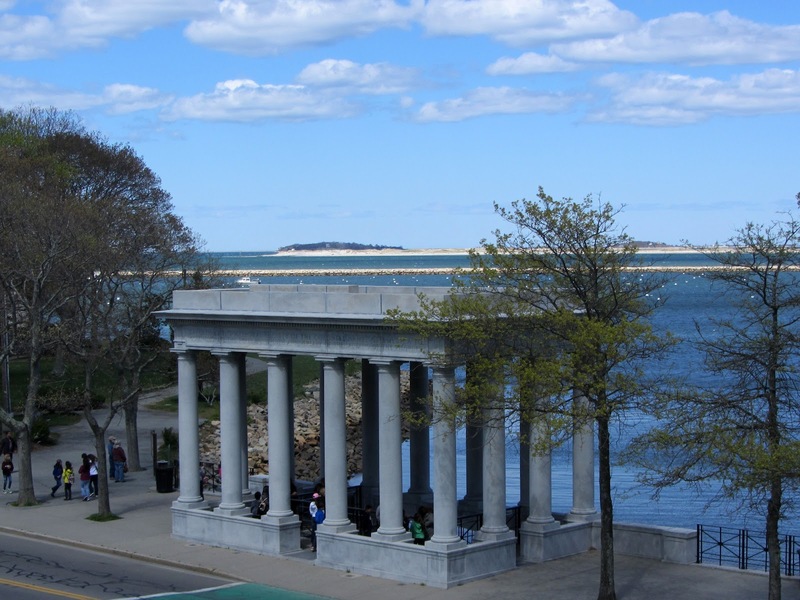 Our last stop in Plymouth was the National Monument to the Forefathers. Unlike Plymouth Rock, this monument was much larger than we expected. 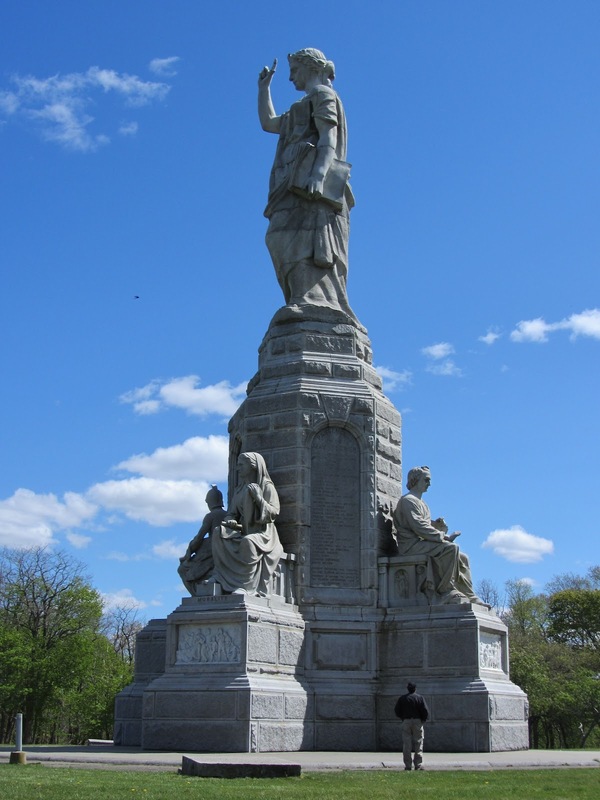 Commissioned by the Pilgrim Society, the statue was completed in 1889. As originally planned, the statue would have stood at 150 feet, about the same as the Statue of Liberty. Financial exigencies reduced the height to 81 feet, still plenty imposing and quite impressive. 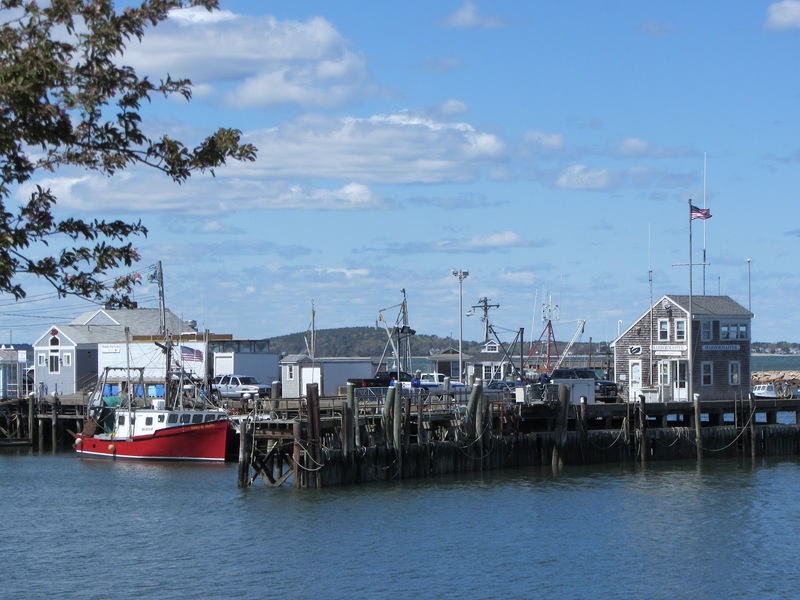 Since our destination for tonight, Salem, is less than 60 miles away from Plymouth, we were in no particular rush to complete our sightseeing and letterboxing in Pilgrim land and move north. What we forgot to consider is that Boston lay between the two towns. 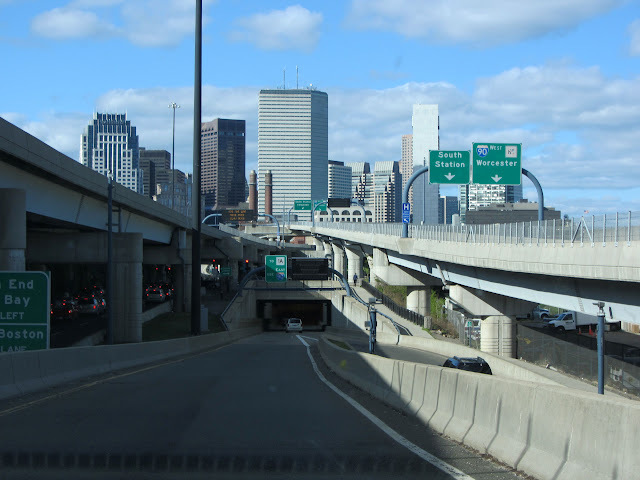 So, of course, we ended up driving through Boston at the height of rush hour. Though we experienced a few delays, we have nothing but praise for the designers of the famed "Big Dig," Boston's central artery tunnel through the heart of the city. What would have been a three-hour (or more) nightmare traversing central Atlanta at rush hour turned out to be a barely one-hour jaunt through Boston. Though this project has engendered more than its share of criticism for cost overruns and other problems, it worked great for us today. "Oh, come on! Quit being such a honky."